Buy Our Book – Beasley & Associates Inc.
As world population grows, and more people move to cities and suburbs, they place greater stress on the operating system of our whole planet. But urbanization and increasing densities also present our best opportunity for improving sustainability, by transforming urban development into desirable, lower-carbon, compact and walkable communities and business centers. 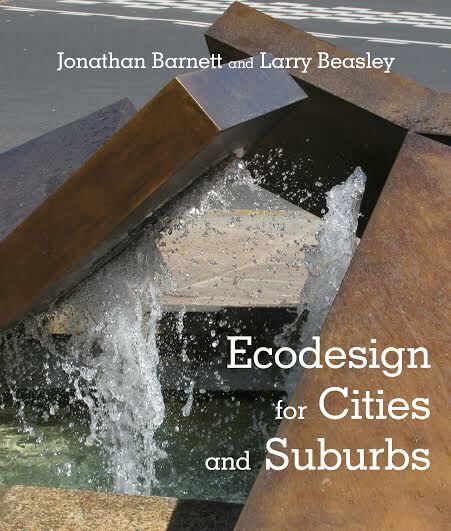 Jonathan Barnett and Larry Beasley seek to demonstrate that a sustainable built and natural environment can be achieved through ecodesign, which integrates the practice of planning and urban design with environmental conservation, through normal business practices and the kinds of capital programs and regulations already in use in many communities. Ecodesign helps adapt the design of our built environment to both a changing climate and a rapidly growing world, creating more desirable places in the process. In six comprehensively illustrated chapters, the authors explain ecodesign concepts, including the importance of preserving and restoring natural systems while also adapting to climate change; minimizing congestion on highways and at airports by making development more compact, and by making it easier to walk, cycle and take trains and mass transit; crafting and managing regulations to insure better placemaking and fulfill consumer preferences, while incentivizing preferred practices; creating an inviting and environmentally responsible public realm from parks to streets to forgotten spaces; and finally how to implement these ecodesign concepts. Throughout the book, the ecodesign framework is demonstrated by innovative practices that are already underway or have been accomplished in many cities and suburbs—from Hammarby Sjöstad in Stockholm to False Creek North in Vancouver to Battery Park City in Manhattan, as well as many smaller-scale examples that can be adopted in any community. Ecodesign thinking is relevant to anyone who has a part in shaping or influencing the future of cities and suburbs – designers, public officials, and politicians.